The Lady Titans are now 4-0 in league play, 9-2 overall, after a 73-47 win over the Ouray Lady Trojans on Saturday, February 2. The two teams have a long-standing intense rivalry and while the Lady Titans beat Ouray by 11 points during a pre-season tournament this year, anything can happen when they play them in Ouray. 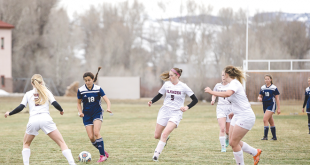 Fortunately, Ouray did not see the press from the Lady Titans in the first meeting two months ago so they had no idea what to expect when the two teams met for the second time. “Our press just frazzled them and that was the idea going in,” says Lady Titans coach MaryMike Haley. The Lady Titans backed its press with a smooth passing attack on offense, resulting in several baskets from the entire team. Junior Emma Vosburg led the Lady Titans scoring 25 points; senior Emma Coburn was one assist shy of a triple-double, with 19 points, 22 rebounds and nine assists. In addition, juniors Allie McFarland and Jessie Frame had standout performances scoring eight and nine points, respectively, and sophomore Sydney Loyed added eight points and six rebounds in the game. “The rest of the starting five are just stepping up, which is huge,” says Haley. The Lady Titans took a 31-17 lead into halftime and Haley turned to her bench in the third quarter to get some younger player’s varsity experience. Haley also pulled the press off and used the third quarter to have her team work on its man-to-man defense. Ouray took advantage of the break from the Lady Titans’ press to pull back within seven points with four minutes left in the game. Haley called a time-out, turned to her starting five and gave them a challenge. “I told them to go hard for two minutes,” says Haley. The starting five answered the call of their coach and proceeded to pull the game far out of Ouray’s reach. Their efforts capped a 30-point fourth quarter from the Lady Titans as they ran away with the 73-47 win. 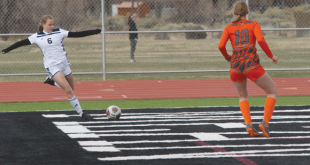 After two non-league games on the road this week, the Lady Titans return to Mt. Olympus to face Ouray once again on Saturday, February 9 at 1 p.m.